History: (Fight-Man#1) - The All-Hate Squad, with "a hundred new members," were hired by the Hooded Eye to kill Fight-Man. They planned to use the ten million dollar reward to complete their master plan: the utter destruction of France. They failed in both endeavors. (Agent X#11) - The 'All-New All-Hate Squad' were hired by the Hooded Eye and Beverly Lacoco to kill Fight-Man and Agent X. They failed in both endeavors. Comments: Created by Evan Dorkin & Pam Eklund. Mr. Gimmick, a NES game character @ Gimmick! (Fight Man#1) - The Able-Bodied Assassin carries a large collection of concealed knives in his uniform. Fight-Man returned home only to discover that the Able-Bodied Assassin and the Polka Doctor had been invited in by his parents having claimed to be his friends. He defeated them very easily. (Fight Man#1 - BTS) - Aggressive Eleven killed one of Fight-Man's former sidekicks, Kid Wipeout. (Fight-Man#1 (fb) - BTS) - Atomic Lou murdered Fight-Man's sidekick, Kid Hit. (Fight-Man#1) - Accompanied by the Plug-In Maniac and the Massive Globula, he attacked Fight-Man during a business meeting. Fight-Man knocked him unconscious. (Agent X#10) - Atomic Lou appeared in Fight-Man's case scrapbook; he carries an energy rod which generates atomic power blasts and which also regulated his own internal energies. (Agent X#11) - Accompanied by Metalhead and the Massive Globula, he attacked Fight-Man and Agent X. Fight-Man shattered his energy control rod, causing him to reach critical mass and explode. (Agent X#11 (fb) - BTS) - Babe Ruthless slit the throat of one of Fight-Man's kid sidekicks, Fight-Boy (Tyrone). (Fight Man#1) - Big Strong Man (Steve Kisto), Bigger Stronger Man (Tracey Griffin), and Biggest Strongest Man (Chuck Manassa) were founding members of the All-Hate Squad. They each are big and strong, with ascending heights and degrees of prowess. Fight-Man knocked the first two unconscious by slamming their heads together, and hit the third into the Hudson Insurance Building (which unfortunately fell over on him, knocking him out). (Agent X#11) - He was a member of the All-New All-Hate Squad hired by Hooded Eye and Beverly to kill Fight-Man and Agent X. Blacklung's 'hands of cancer' were chopped off by Agent X. (Fight Man#1) - "Triggerman" Carr is handy with guns. Accompanied by Glass-Eye Freddie and Metalhead, he attempted to rob a woman of her purse, before being intercepted by Fight-Man who hit him hard enough to knock out both of his eyes, rendering him blind. Fight-Man quickly knocked him out. (Fight Man#1) - Chimpanzo Rex appears to be a giant simian; he was one of the hundred or so members of the All-Hate Squad who were hired by the Hooded Eye to attack Fight-Man. He was defeated by Fight-Man. (Fight Man#1) - The Coin-Op Creeps are at least five rentable robots, which can be activated by inserting coins into their chest plates (twenty-five cents for a half-hour). Kenny Liebman attempted to use them as a weapon of last resort against Fight-Man, only to find that he was lacking in change. 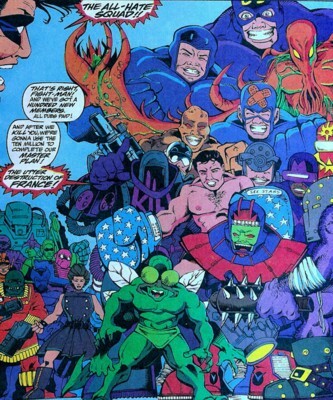 (Official Handbook of the Marvel Universe HC#4 - Fight-Man) - Increased misuse of the Coin-Op Creeps by the underworld led to the Robot Gang War. In the war's wake several robots were left hidden awaiting their activation. 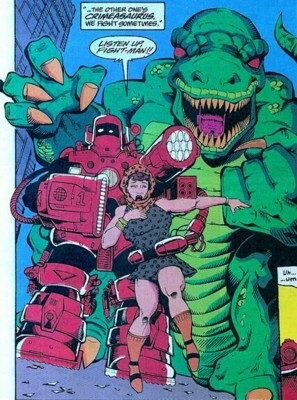 (Fight-Man#1 (fb) - BTS) - Crimeasaurus wore a dinosaur costume, which presumably grants heightened strength; he later rented it to Crimeasaurus Two. (Fight Man#1) - Crimeasaurus Two wears a dinosaur costume, purchased from Crimeasaurus (Takahashi), which presumably grants heightened strength; he and The One-Man Atrocity invaded the office of Fight-Man's attorney, and Fight-Man managed to yank him out of his costume and toss him through a skyscraper. (Agent X#11) - Renaming himself Crimeasaurus Rex he allied himself with the All-Hate Squad to assassinate Fight-Man. 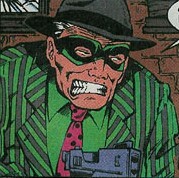 He eventually had an arm shot off by Agent X during a melee in downtown Delta City. (Fight Man#1 (fb) - BTS) - Doctor Anarchy used an underground secret base from which to operate using his Anger Gang. When he was jailed for tax evasion, he rented the base to the Hooded Eye (Lieberman). (Fight Man#1 (fb) - BTS) - In a previous battle with Fight-Man, Doctor Tricky lost his hypno-specs, which Fight-Man attempted to sell for memorobilia. (Fight Man#1) - Fisticuff-Woman was a founding member of the All-Hate Squad, and appears to be nearly as good as Fight-Man at fisticuffs. Although briefly unable to strike back due to his 'superhero code' which disallows him from hitting girls, he was able to overcome this disability by using a magic marker to paint a beard and mustache on her face, renaming her "Fisticuff-Man." (Fight Man#1) - Generic Badguy was one of the hundred or so members of the All-Hate Squad who were hired by the Hooded Eye to attack Fight-Man. His relationship to Generic Super-Hero, if any, is unknown. He was quickly defeated by Fight-Man. 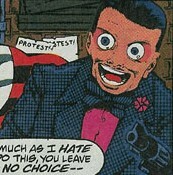 (Fight Man#1) - Glass-Eye Freddie sports a pair of cybernetic eyes. Accompanied by Metalhead and Triggerman Carr, he attempted to rob a woman of her purse, before being intercepted by Fight-Man who hit him hard enough to knock out both of his eyes, rendering him blind. Fight-Man absconded with one of the eyes for his eyes to sell as memerobilia. 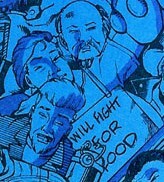 Glass-Eye Freddie appeared in Fight-Man's case scrapbook. (Agent X#11) - Ill Billy, the 'mutant yodeling human beatbox,' used a devastating sonic attack against Fight-Man and Agent X (as well as anyone else in downtown Delta City who happened to be in earshot). Fight-Man and Agent X were unable to resist the sonic attack, until Agent X requested that Fight-Man rip his ears off. Fight-Man shoved Agent X's ears into the resulting holes at his request. 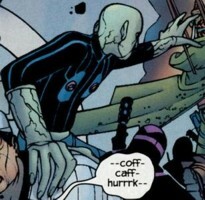 Insulated against Ill Billy's attack, Agent X was able to approach him from behind and knock him unconscious with a baseball bat. (Agent X#11) - Katmandingo was one of the villains whom DoctOrangutan used as a power source to infuse Beverly Lacoco with super-abilities. 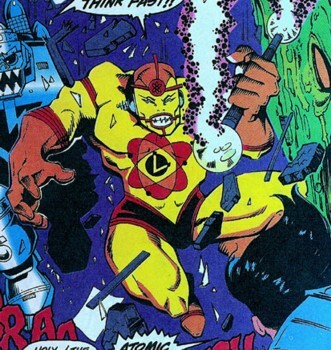 (Fight Man#1) - The Massive Globula has the powers one would expect of a massive globula; accompanied by Atomic Lou and the Plug-In Maniac, he attacked Fight-Man during a business meeting. Fight-Man buried him alive in hot plastic. (Agent X#10-11) - Accompanied by Atomic Lou and Plug-In Maniac, he attacked Fight-Man and Agent X. Fight-Man shattered Atomic Lou's energy control rod, causing him to reach critical mass and explode, and catching the Massive Globula in the impact. (Fight Man#1) - Meany wears a numbered football jersey labelled "Meany;" he was one of the hundred or so members of the All-Hate Squad who were hired by the Hooded Eye to attack Fight-Man. He was quickly defeated. (Fight Man#1) - Metalhead has, apparently, metallic skin. Accompanied by Glass-Eye Freddie and Triggerman Carr, he attempted to rib a woman of her purse, before being intercepted by Fight-Man who knocked him into the sky. Metalhead's comment, "Oh, cripes, not again," makes it evident he had encountered Fight-Man before, with similar results. (Agent X#11) - Metalhead, along with several other villains, occupied the office of Delta City's mayor. Metalhead arranged to be fired out of a cannon at Fight-Man at sixt miles per hour. Unfortunately, he led with his chin, and Fight-Man easily deflected his path upwards. He prayed to make the harbor on his way down. Metalhead fell to Earth, landing atop the now-powered Beverly Lacoco, knocking her unconscious. Before he landed, she terminated his status as an employee. (Agent X#11) - Mr. Density, along with several other villains, occupied the office of Delta City's mayor. When the Mayor of Delta City swore at Beverly Lacoco, she instructed Mr. Density to throw him out the window if he failed to silence himself. Asked whether he understood, Mr. Density replied, "Uhhh, yah, I fink so ... "
Mr. Density was one of the villains whom DoctOrangutan used as a power source to infuse Beverly Lacoco with super-abilities. (Fight Man#1) - Mr. 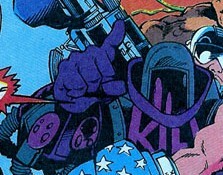 Kill was a founding member of the All-Hate Squad. Hired by the Hooded Eye to kill Fight-Man he was quickly beaten by the hero alongside the rest of the All-Hate Squad. (Fight-Man#1) - Mr. Troublesome has in place of hands, a pair of extendable "troublewrenches;" he appeared in Fight-Man's case scrapbook. Mr. Troublesome was one of the hundred or so members of the All-Hate Squad who were hired by the Hooded Eye to attack Fight-Man. Fight-Man at one point absconded with a troublewrench as a piece of memorabilia. 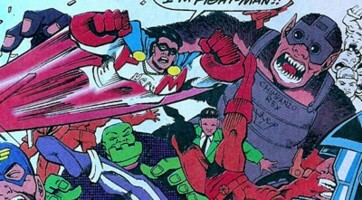 (Fight-Man#1) - The One-Man Atrocity wears advanced armor; he and Crimeasaurus Two invaded the office of Fight-Man's attorney, and Fight-Man managed to destroy his armour with one blow from his fist. (Agent X#11) - The One-Man Atrocity attempted to assassinate Fight-Man; he was defeated by Agent X swinging from a grapple-hook. (Fight-Man#1) - The Plaid Bug appeared in Fight-Man's case scrapbook. (Agent X#11) - The Plaid Bug allied himself with the All-Hate Squad to assassinate Fight-Man. (Fight-Man#1) - The Plug-In Maniac is a cyborg who can fire missiles from his shoulders and probably has other armaments; he appeared in Fight-Man's case scrapbook. (Fight-Man#1) - Accompanied by Atomic Lou and the Massive Globula, he attacked Fight-Man during a business meeting. Fight-Man decapitated him, rendering him useless in battle. (Agent X#10-11) - Accompanied by Atomic Lou and the Massive Globula, he attacked Fight-Man and Agent X. Fight-Man flew straight through Plug-in-Maniac's torso, which decapitated him. 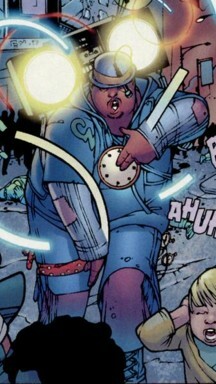 (Fight-Man#1) - The Polka Doctor makes use of his Hypno-Hate Wheel (similar to the Ringmaster's technology) to hypnotise his foes, whereupon he attacks them with a variety of medical implements; he appeared in Fight-Man's case scrapbook. (Fight-Man#1) - Fight-Man returned home only to discover that the Able-bodied Assassin and the Polka Doctor had been invited in by his parents having claimed to be his friends. He managed to resist the Doctor's Hypno-Hate Wheel (probably by being too stupid to hypnotise) and defeated them very easily. Hypno-Hate Wheel is likely a play on Hypno Love Wheel, which was a musical band of which I believe some Marvel staffers were once a part. 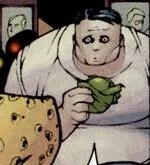 (Agent X#11) - The Polka Doctor was kicked in the head by Agent X during a battle in Delta City. (Agent X#11) - Quickstart was one of the villains whom DoctOrangutan used as a power source to infuse Beverly Lacoco with super-abilities. 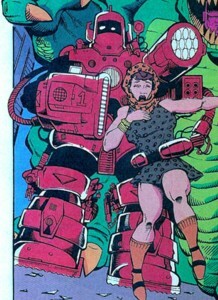 (Fight-Man#1) - Radio Head (briefly known as Television Head) has a radio for a head; he appeared in Fight-Man's case scrapbook. (Fight-Man#1) - Radio Head was one of the hundred or so members of the All-Hate Squad who were hired by the Hooded Eye to attack Fight-Man. (Agent X#11) - Roman Candle, along with several other villains, occupied the office of Delta City's mayor. 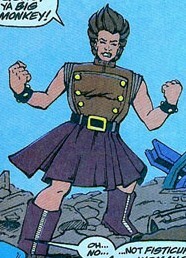 Roman Candle appeared to have her arm broken off during an explosion in the battle with Agent X. She may be made of wax.. 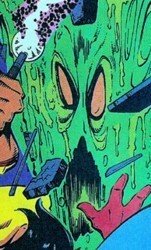 Apparently another version of Roman Candle was one of the villains whom DoctOrangutan used as a power source to infuse Beverly Lacoco with super-abilities. Gievn that Lacoco later manifested flame powers, she probably received them from Roman Candle. (Agent X#11 (fb) - BTS) - Shiv knifed two of Fight-Man's assistants, the Fight Twins (Fight-Boy and Fight-Girl), because Fight-Man called him a pansy. Shiv contacted Agency X for the Hooded Eye to hire them to assassinate Fight-Man. 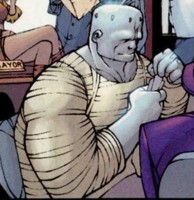 (Agent X#11) - Shiv, along with several other villains, occupied the office of Delta City's mayor. He kept an eye on Sandi Brandenburg, holding a knife to her throat. She shot him and other villains (including the mayor) with a machine gun while Fight-Man and Agent X fought other villains nearby. (Agent X#11) - Slapp Happy commenced rocketing rubber chickens at Fight-Man and Agent X.
Slapp Happy was disposed of by Agent X. 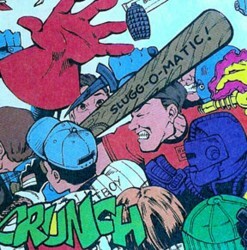 (Fight-Man#1) - Slugger carried a baseball bat labelled "Slugg-O-Matic;" he was one of the hundred or so members of the All-Hate Squad who were hired by the Hooded Eye to attack Fight-Man. (Agent X#11) Slugger is inadvertently (or casually) killed by Blacklung's 'hands of cancer'. (Fight-Man#1) - Stilt-Man was one of the hundred or so members of the All-Hate Squad who were hired by the Hooded Eye to attack Fight-Man. Which Stilt-Man this is, exactly, is unknown., although he probably downloaded the schematics of the suit off the internet. (Fight-Man#1) - Some alien jerk Fight-Man beat up appeared in Fight-Man's case scrapbook. (Fight-Man#1) - "Will Fight For Food" carried a sign around his neck labelled "Will Fight For Food;" he was one of the hundred or so members of the All-Hate Squad who were hired by the Hooded Eye to attack Fight-Man.